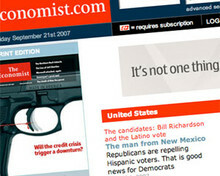 The Economist Group is using the power of the blogosphere to build 'buzz' for its political stories before they are published. Having identified a group of influential US political bloggers, the media company gives content to these individuals in order to begin circulation, Mike Seery, chief information officer of The Economist Group, told delegates at an AOP forum, in London yesterday. Seery's comments came in a discussion with Dr Dietmar Schantin, director of IFRA's Newsplex project, about how to increase page views online. Schantin, who advised the Telegraph Group on its move to a fully integrated newsroom, said he was aware of the importance of blogs in driving up viewing figures. He said blogs and aggregation sites have become the main source for links to newspaper sites as this is where most of their content comes from. "What we've found to be very successful for getting views is to actually engage with bloggers," said Seery. "In the US we identified the 100 most important political bloggers and we effectively give them content before it's published in print, so that it builds a buzz around the thing before it's there. "It takes work and it's not the exclusives you might get in a national daily here [in the UK], but it's the sort of thing that create a big buzz and brings lots of traffic the next day," he added.